The Grand Prix of Italy at a rain-hit Maggiora saw 36,000 eager fans file into the popular circuit north-west of Milan and Rockstar Energy Suzuki World MXGP’s Kevin Strijbos secured an affirming second place overall by winning the second moto for what was the ninth round of 18. Half of the 2015 FIM Motocross World Championship was scratched before the series encountered its first ‘mud’ race and Strijbos took his works RM-Z450 to a 9-1 scorecard for his first trophy of 2015. Maggiora offered its usual flavour of hard-pack hills with challenging descents and climbs, some big leaps and a largely flat and flowing layout. The weather was an unstable factor through the weekend with only a brief spell of rainfall on Saturday afternoon when fiercer showers were forecast. On Sunday the water arrived: Downpours throughout the morning threatened the running of the event or at least a change of the race programme. Thankfully the rain eased by late morning and although the track was heavy, slippery and treacherous, it was also softer and slower and this was an advantage for the Belgian. Strijbos showed that his recent spell away from Grand Prix to recover from right wrist and thumb problems had not ebbed at his speed. The veteran was a little rusty for race-pace and mileage at the current MXGP sharp-end but was a determined figure. Setting off from seventh in the gate Strijbos gained a position a lap from the first four circulations to rise to fifth but then made a mistake and crashed, putting him down to 10th. He was able to follow Shaun Simpson and then relegate Jose Butron to come home with ninth spot. In the second dash Strijbos was immediately at the front and harassing Max Nagl for the lead for most of the moto. In the closing laps he drew nearer to the German to set-up a thrilling finale and moved into first position with just over half a circulation remaining to the flag. It was ‘#22’s first victory since the Grand Prix of Czech Republic last summer. Fifth position in Saturday’s Qualification Heat gave Rockstar Energy Suzuki Europe’s Glenn Coldenhoff a confidence-boost around the tricky hard-pack course. The Dutchman would go on to secure 15th overall on Sunday as good fortune deserted the MXGP rookie. The first moto saw him as part of a group going for the top-five until he lost rear traction on the start straight beginning the second lap and went down. He then lapped until 16th. In the second outing he fell on the first lap after failing to avoid a fallen rider on the hill but was able to find a better rhythm compared to the first race to get back to 12th. Clement Desalle attempted both Free and Timed Practice on Saturday but eventually felt compelled to withdraw from the Grand Prix due to a problem with the MCL in his left knee. The slight injury was a repercussion of his misfortune at Villars sous Ecot a fortnight ago. Now 41 points behind championship leader Max Nagl before Maggiora, his ailment effectively ends any aspiration of the 2015 title after a consistent and promising start to the campaign. It is likely that the Belgian will also sit out the Grand Prix of Germany next week in order to let his knee joint heal. Talkessel in Teutschenthal is the customary site for the German fixture on the MXGP schedule and will take place on June 20-21st. MXGP World Championship Standings (after 9 of 18 rounds): 1. Maximilian Nagl (GER, HUS), 360 points; 2. Antonio Cairoli (ITA, KTM), 330 p.; 3. Romain Febvre (FRA, YAM), 322 p.; 4. Clement Desalle (BEL, Rockstar Energy Suzuki), 291 p.; 5. Gautier Paulin (FRA, HON), 279 p.; 6. Evgeny Bobryshev (RUS, HON), 270 p.; 7. Shaun Simpson (GBR, KTM), 200 p.; 8. Todd Waters (AUS, HUS), 174 p.; 9. Jeremy Van Horebeek (BEL, YAM), 158 p.; 10. Ken de Dycker (BEL, KTM), 155 p.; 11. 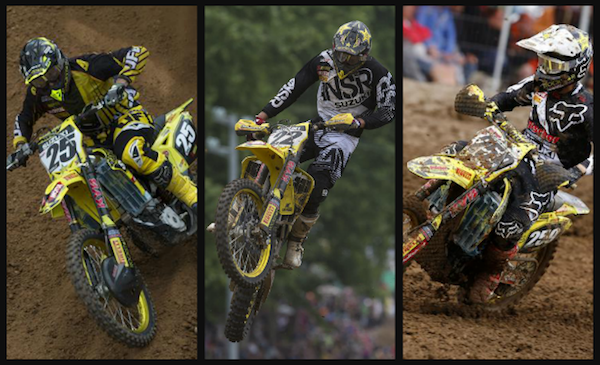 Glenn Coldenhoff (NED, Rockstar Energy Suzuki), 148 p.; 15. Kevin Strijbos (BEL, Rockstar Energy Suzuki), 115 p.